yesterday we were talking about photographers, or at least i was, while you were listening attentively. and it seems a sizeably tautological statement to point out that photographers need cameras, the market for which seems to have been gradually becoming more and more macho, for want of a better word. i'm sure i'm not the only one to have noticed this; those chunky lenses, notched adjusters, wall to wall matt black and styling that is anything but passive. i'm not suggesting that brightly coloured little compact digitals will outpace the canon, nikon and olympus dslr models on sale, no matter the number of megapixels on offer, but it is an incontrovertible truism that a fair number of those in possession of matt black and chunky leave the setting on auto and have purchased only for the perception that they may have a clue as to what it's all about. you can deny this all you want, but the pixels do not lie. the same argument could of course, be levelled at those with top of the range carbon married to the sprinting or climbing abilities of a chelsea pensioner. marketing dictates that the big sell should be aimed at those with all but unlimited disposable income; nothing intrinsically wrong with that, particularly if ownership of technology currently better than the ability to use it, leads to aspirations of excellence. sadly that isn't always the case. but there is another aspect of cycling that almost mirrors that of the digital single reflex camera, though probably not quite fulfilling the sales engendered by the former. i am aware of at least one person who owns a workshop quality park tool stand, yet would struggle big time to identify which is the rear derailleur cable, let alone replace it. i believe the applicable term is all show and no go. this may be a further example of disposable income gone mad, for fine workstand though it is, at best it seems vastly underused in this particular case, employed only to sit the cycle on when residing in the garage; it is notably not accompanied by any number of appropriate workshop tools. my early years of association with bicycles was predominantly coloured by the need to repair the blighters, a situation that blatantly advertised the need to own a workstand, if only to save my back and knees from scraping around on a concrete floor. 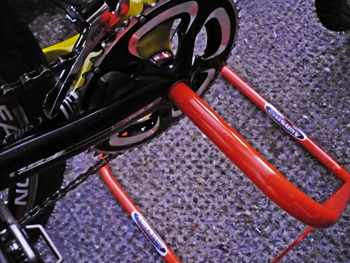 a good stand for professional use can quickly clamp any type of frame securely, offering sufficient adjustment to obviate any need for contortion when adjusting a finicky rear derailleur. given the weight of present day kids' full-suspension efforts, stability is paramount. however, both the cost and flexibility of the more expensive versions are directly aimed at the more professional amateur or, indeed, a professional mechanic. you can often judge in advance the quality of shop repair by the quality of the stand sitting (standing?) in the middle of the workshop floor; that and the neatness and population of the tool board on the wall behind. 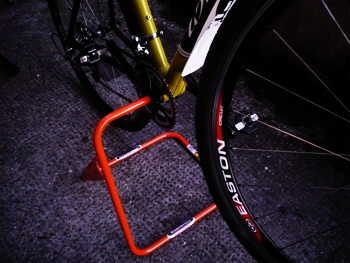 but, much like the telephoto lens and independent flash unit, a workshop stand is not a necessity for everyone who owns a bicycle, particularly those who drop an errant machine off at their local independent bikeshop to have the tyres pumped up. 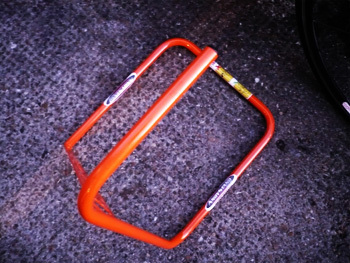 but it is not entirely out of the question that some sort of bike stand allowing the occasional allen bolt adjustment, wheel removal or simply engendering a decent foamy scrub, could be seen as desirable if not an actual necessity, and preferably something that does not exceed the cost of a decent pair of tyres. last week i was sent a weblink to a video of a university ipad band, the members of which, fairly entertainingly, were playing a series of christmas tunes on virtual touchscreen instruments plugged through a backline of amplifiers. i cannot pretend that the sound was redolent of, say, the london philharmonic, but that would be likely to miss the point. here was the perfect example of one company (apple) 'inventing' a hitherto unseen technology, and others in related fields taking advantage of the opportunity provided. i have been less than sparing in my ire directed towards what i consider the over- development of the bottom bracket. what on earth was ever wrong with the square taper that a decent method of crank removal wouldn't have fixed? but rather than emulate victor meldrew in a pointless diatribe against something that was never going to be uninvented, andy richards looked at the wholesale change as an opportunity rather than pining for bottom bracket nostalgia. it is a feature of the majority of contemporary bb offerings, that what used to be known as the spindle, but now likely more correctly named the axle, is hollow. you can see inside it. and it is empty space that is doing nothing whatsoever other than providing torsional rigidity. mr richards has occupied that space. the andystand, available in silver or bright orange, has a triangulated and stable base, leading tubularly to a transverse arm at the top. a pathetic description, but one which makes far more sense if you've sneaked a look at the photos. an orange version of the stand, in a very clever triangular box, had been despatched before i took time to closely look at the andystand website. if you undertake to do likewise, you cannot fail to notice that the velocipedes being upheld by a variety of andystands, are all of the knobbly tyre variety. thewashingmachinepost bikeshed contains nothing but skinny tyres, apart, of course, from the ibis hakkalugi, and even it is shod with less than truly chunky. what if it didn't fit? as you can see, it fits just fine; the cielo has sram red, the ibis and colnago master both own chainsets from fsa, and the andystand fits all just dinky doo thank you very much. it is, it humbles me to say, verging on genius. 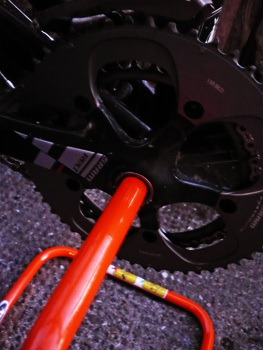 andy has listed a series of compatible chainsets on the website, all of which are of mtb flavour. i'm not too sure if it works with campagnolo's ultra-torque sets because i don't own one, and the closed design of shimano's road chainsets rather precludes their inclusion, but i'm pretty sure that all types of fsa and sram should prove ideal, along with campag's new ten speed power-torque sets added to centaur and below for 2011.
the the width of the base provides total stability, while the arm that slides into the hollow part of the bottom bracket is sturdy enough to support pretty much anything resembling a bicycle. given that the bb axle is the central pivot point of the cycle, one wheel rests on the ground while the other sits in mid-air. thus it is but a simple procedure to remove one or t'other for maintenance, tilting the bicycle back or forward depending on need. tip the bike forward onto the front wheel and tis yet another piece of cake to spin the pedals and adjust the front or rear gears as necessary. in fact with the minimum of contortion, it was easy to clean those sprockets with a purple harry pipe cleaner. 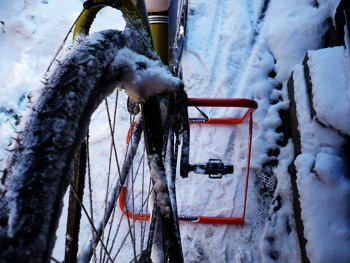 what more could a bike rider want? even if your mechanical knowledge extends no further than the ability to purchase a can of three-in-one oil, you need one of these in the armoury to facilitate a decent level of cleaning, tyre changing or puncture repair. leaning against walls is so yesterdays news. although the andystand doesn't fold for storage, it really isn't big enough to provide a storage problem; if you hang onto the box in which it arrives, you could pop it back just to keep it safe and out of trippings way. however, you just know the skinny wheelers will need it in carbon. 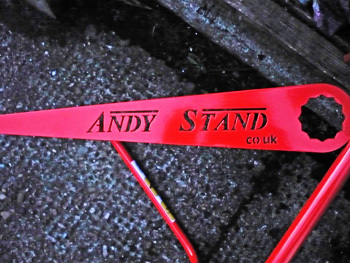 the andystand is available in silver or orange at a cost of only £39.99. though it's too late to have one sent out for christmas, this is the way to start the new year.